Hey everyone, it’s getting to the season where most of Chicago’s outdoor festivals start to take place. Please take some time to write a comment about which festival is your favorite to go to, a festival that you clear your schedule for, or a festival where you take a sick day so you can attend. Give some information about what goes on and where it’s at if you can! I’ll update with some as well! Ribfest 2009! My schedule's already cleared! Before our random visit to Molly’s Cupcakes, James, Melody, Anna, and I went for a LATE dinner at Fado Irish Pub, located at 100 W. Grand Avenue, in Chicago’s River North neighborhood. Now, the reason for my all caps lock LATE is because we went at around 8pm at no fault of my own…Melody…so all of our appetites were ready for some good food and beer. To me, Fado Irish Pub is decorated like a medieval log cabin, perhaps an Irish medieval log cabin with basically every surface covered in wood. Our waitress was speedy, attentive without being too attentive, and very nice. Thinking back now, the food at Fado Irish Pub was some of the best pub food I’ve had in Chicago! I ordered the corned beef reuben sandwich which was served on rye bread with cole slaw and fries on the side. I also ordered a Guinness and a Boddingtons. Not sure of prices, it was too good to pay attention. Melody ordered the fish and chips which are lightly battered haddock with thick cut chips, tartar sauce, and homemade coleslaw. To polish off the meal and unless I’m mistaken, Melody ordered a Strongbow Cider. Melody and Anna say Fado Irish Pub’s fish and chips are the closest to the real thing that they had while in Ireland. Impressive. Anna ordered the chicken cheesesteak which is tender chicken, mushrooms, and carmelized onions with American cheese on a hoagie roll. The sandwich is served with Fado’sown boxty straws which compare to Steak n’ Shake’s french fries. She also ordered a Strongbow Cider to top if off…correct me if I’m wrong Anna, Now, Anna was going to order the fish and chips but got self conscious about ordering the exact same thing as Melody. Lame. James ordered the old fashioned cheesesteak which is steak, mushrooms, and carmelized onions with American cheese on a hoagie roll. His sandwich was also served with boxty straws. No beer for James though. Different place, different neighborhood…Lakeview to Fulton River District. I may miss a day or two of updating ChicagoismynewBlog due to my moving from Lakeview/Lincoln Park to my new homestead in the Fulton River District. I’m going to be pretty busy packing, moving, unpacking, etc. but don’t worry, I shall return with new posts. I already have at least 4 ideas of new posts in my head…and normally that means it’s pretty full. Remember to keep spreading the word about ChicagoismynewBlog. Update your facebook, myspace, when submitting a comment, I would love it if you included ChicagoismynewBlog’s URL at the bottom! Thanks to everyone. Sugar high at Molly’s Cupcakes in Lincoln Park (4.5/5 stars). So on a day of binging, James, Anna, Melody, and I drove North to Molly’s Cupcakes, located at 2536 N. Clark Street, in Lincoln Park. We visited on Wednesday night and we had to speed up there because they close at 10pm Sunday through Thursday and are open till midnight on Fridays and Saturdays. Molly’s Cupcakes is amazing and reminds me of being a kid…if only my adult body could handle that much sugar in one sitting. There are plenty of board games and even some swings, yes swings, up by the counter to enhance your flashback to childhood. I ordered the peanut butter Nutella cupcake which is a peanut butter cake, Nutella filling, and a buttercream Nutella frosting. I also bought a wild berry cupcake which is a blueberry cake, raspberry/blueberry filling, and a buttercream with fresh berries. ($3.75 each). Melody ordered the tiramisu cupcake which is a vanilla butter cake, classic tiramisu filling, and a fluffy buttercream as well as a lemon meringue cupcake ($3.75 each). Anna ordered the chocolate decadence cupcake ($3.75). James ordered the cookies-n-cream cupcake which is a chocolate cake, cookies-n-cream filling, vanilla buttercream, and a cookie topping as well as a cookie dough cupcake ($3.75 each). Now, I do realize that $3.75 is pretty insane for just one cupcake, but I obviously won’t go out and get these every day. Molly’s Cupcakes is great for the occasional time you treat yourself. We all came in about ten minutes before Molly’s was to close but the staff was still extremely nice and very helpful. Thank you to Yelp Chicago for the pictures and also to Molly’s Cupcakes’ website for all of the information! 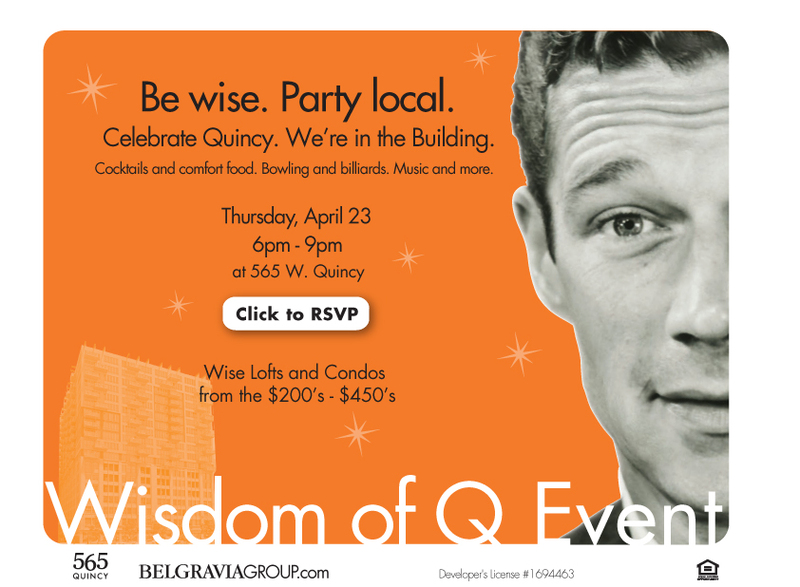 Wisdom of Q event TONIGHT with Belgravia Group’s 565 Quincy and Time Out Chicago! Come and join Belgravia Group’s 565 Quincy and Time Out Chicago for the Wisdom of Q Event at 565 W. Quincy Street in the West Loop! The Wisdom of Q Event will be tonight from 6-9pm in 565 Quincy’s amazing amenities room, called the Q Room. A great turnout is expected, so great that everyone chose to have another party next Thursday, April 30th also from 6-9pm! So if you can’t make it tonight, we would love to see you there next Thursday night. Trio messed up Kinzie Station Condominiums’ original plans! Part of the earlier development at K Station included Kinzie Station Condominiums which is just South of Echelon at K Station. Plans originally called for a twin of Kinzie Station Condominiums where Trio is now located. Check out the picture from Linn-Mathes Inc.’s website. Original Plans for Kinzie Station condominiums. Is Blommer’s chocolate smell a pro or a con to you? I’ve mentioned the smell of chocolate wafting through the air from the Blommer Chocolate Company in a couple earlier posts and I want to see what everyone thinks about the smell. With the explosion of new condos and apartments being built basically across the street from the Blommer factory, these residents most likely know about the smell of the chocolate before they even buy or rent their home. Would you want to live across from something that churns out the smell of chocolate on a daily basis? ChicagoismynewBlog would…and I would even get a North facing home (Blommer is North of the new bulidings). Vote time! Alta and Cirrus at K Station. Back to the Fulton River District! K Station is an area in the Fulton River District that includes buildings like Echelon at K Station, Left Bank at K Station, a brand new city park, and two more buildings that are under construction, called Alta and Cirrus at K Station…no websites yet. All four buildings are rentals which is extremely smart of the developer(s), because as soon as the market is back to normal, they can easily convert these apartments into condos. These pictures are mainly of Alta and Cirrus at K Station, both designed by Pappageorge/Haymes, Ltd and both are currently under construction. Alta, currently the tallest, will remain the tallest at 41 stories when completed and Cirrus will be a bit shorter with 37 stories. Both rental buildings expect to be completed in 2010. I bet they’ll bring a good mix of people to the neighborhood too…people who get to enjoy constant smells of chocolate. From left to right: Kinzie Street Station and Echelon at K Station. The Park at K Station is in foreground. I just want to make sure you vote for what YOU want to see for future posts at ChicagoismynewBlog! Scroll down to vote at the 1,000 hits post!